Sometimes when we discuss pack weights and lighter equipment there is an underlying assumption that this is a relatively new idea made possible by new technology, materials, or ideas. 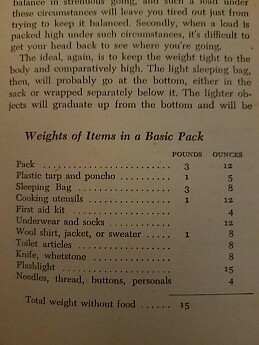 Not entirely unfounded but let's not forget that lighter packs have been around for a while...here's a basics gear list from Bradford Angier "The Modern Handbook of Backpacking" (1972). 15 lbs without our modern materials...i found this interesting rereading some old books (which weren't that outdated when I first put a pack on!) , but I might just be going stir crazy stuck at home during prime backpacking season! That's cool, although it does not include a water filter or a bear canister! Col Tonwsend Whelen was carrying a light pack when he came back from WWI. Nessmuk was carrying a light pack around 1900. John Muir would go out for a week or so in the Sierras in summer with an overcoat, some biscuits and tea and little else. Travleing light is not new at all. Flip, I read Bradford Angier thoroughly as a wee lad. If the price on the digital edition of How to Stay Alive in the Woods comes down to a reasonable amount I’ll add it to my digital bookshelf. Been looking to do that for sometime now. In 1884 he became more widely published book wise with Woodcraft. He was practicing UL backpacking at least by the early 1840’s. He didn’t have a lot of choice being a very little man with health that was not so robust. I still love paging through my older books and still scour used bookstores for finds but our pastime doesn't produce quite as many volumes as others. I think Bradford's list would be under 10 lbs now so if you had to label him (which I am not a fan of) I would call it UL. Either way it's light enough for me. I'd heard the other names but not as familiar. Will do some reading and digging on the web this winter to learn more about them. Horace Kephart liked balloon silk and down. Calvin Rutstrum traveled pretty light except in winter when he would run dogs or pull a sled. Sig Olsen could make a portage in one trip including his canoe. Native peoples have hunted all over the world going out for days with a very small outfit for many centuries. I learned to backpack from my Dad. He went on a solo trip in 1940 for 10 days with a Trapper Nelson, a bamboo fly rod, a .22 and little else but some blankets and a frying pan. He was 16 years old in western Washington in some country he knew well up beind the family cabin on the Greenwater River. He ate trout, berries, and grouse. When it rained hard he would head for one of the old CCC shelters much like the ones on the AT. He can describe the trip in detail from 78 years ago. He just had his 94th birthday. To learn more about backpacking, not just woodcraft or scouting, in the early 60's, the only two published books I could find were about getting lighter. One was "Light Weight Camping Equipment And How To Make It" by Gerry Cunningham (Gerry Equipment) and Margaret Hansson, copyright 1959. My second edition was 1961. And the second was "Going Light With Backpack Or Burro" published by The Sierra Club. Can't find it at the moment so I can't say the publishing date. It's just my guess that packing light became less of an issue with the publication of Colin Fletcher's popular bible for backpackers until going light was "rediscovered" a couple decades ago. True! I recall when I was in the Scouts in the 1960s the adage (an old one at the time) was "Count every ounce, every ounce counts". Tents were Paddy Pallin lightweight cotton japara waterproofed with paraffin wax and with no floor, no insect screens and no poles. My recollection was under 3 lb for a 3-4 person tent with pegs. For poles we used dead branches or tied it between trees and for a floor, each person had a waterproof cape. It was a simple, lightweight and extremely flexible design. You could "abdul" the sides in hot weather and put three in a row, using the middle one as communal area. I had (and still have) a Paddy Pallin framed pack. Small (about 35 litres), not lightweight (4.5 lb) but tough canvas with a steel frame. I think the fact it was so small forced us to carry less. We didn't carry water and drank from creeks. We didn't carry stoves, cooking on camp fires instead. Navigation was prismatic compass and map. GPS had not been invented. We just didn't take a lot with us. No changes of clothes, no extra shoes, no walking poles, no gaiters, no mobile phones . . . Basically, just less of everything. At least 15 oz flashlights can be replaced by a 2 or 3 oz headlamp. yieldNM, good idea bringing up a more contemporary Fletcher. Colin Fletcher is an interesting character indeed so good choice for this discussion. In his book, The Thousand Mile Summer, he is anything but UL. He took two cameras, a fishing rod and tackle and a huge Marbles hunting knife among other heavy and totally unnecessary things. The book had a picture of his pack contents. After that he explored making his load lighter and it became an obsession for him. His only knife turned into a tiny Swiss Army Classic which he broke the nail file and scissors off. I didn’t agree with many things he did but some of his endeavors were interesting reads. The Man Who Walked Through Time was good. I also liked Harvey Buchart’s backstory on his relationship with Fletcher in another book called Grand Obsession, all about Buchart and his amazing route finding in the Grand Canyon. Any of those actual books would be good reading during Phil’s recovery. All great choices...my collection of Fletcher books are coming off the shelf for another reread along with Chris Townsend. I will dig for more old stuff as I really enjoy it. Thanks for all the references. Buchart and Fletcher had an interesting relationship...if interested I would also recommend Walking Man by Robert Wehrman. I still drink from creeks, and it's not like giardia is a new thing either. A carefully cultivated tolerance to bacteria is perhaps the greatest weight saver in the history of backpacking. Along with time and energy savings. Not to mention the general feeling of freedom and accord with the land I get dipping a cup and drinking directly from a cold stream. I still drink from creeks, and it's not like giardia is a new thing either. A carefully cultivated tolerance to bacteria is perhaps the greatest weight saver in the history of backpacking. Giardia lamblia is not a bacteria, it is a parasite. I know a guy who says he contracted hepatitis from drinking untreated water while backpacking. It really screwed him up bad. Some parasites and viruses can stay with you permanently so All it takes is one infected animal before you. I’ll either filter or boil my water. Boiling is no big deal, we just make a nice hot drink. Phil, I put Walking Man on my list. I’ve known of the book for a while but can’t find it at my library or on discount for ebook. It looks like an interesting view of Fletcher’s darker side? Its an interesting read for those Fletcherites like me who grew up and learned to backpack with his writings (from the Thousand Mile Summer to the Complete Walker etc). I am admittedly biased as I have a collection of his writings, but I really enjoyed the Walking Man. It does show the darker and reclusive side and elaborates on some of his relationships. It seems to be factual and is very in-depth but I imagine there are some suppositions in it to link sparse evidence together since he was so reclusive. I enjoyed it and will read it again but can't say I'll pick it up and read it every few years (like I do with the Thousand Mile Summer and others). Giardia lamblia is not a bacteria, it is a parasite. Sure, whichever, the point is still the same. Giardia is nothing new, and building a resistance to it is a great weight saver. I agree that boiling water is no big deal, but carrying boiled water from site to site sure can be. Thanks Phil, That book is definitely on my ”to read” list. Giardia is nothing new, and building a resistance to it is a great weight saver. Zalman, my understanding, based on reading a smattering of scientific studies (but not claiming any expertise as I am far from that) is that reactions to and tolerance of Giardia is variable by person. Whether that variation is due to genetics, concentration in the water source, previous exposure, etc, I haven't seen clearly spelled out. Do you have any info or sources to share on that? Not trying to pick on you, as you seem to have a fair bit of experience, but very interested in what this idea is based on. Also just making sure that new folks reading this and using it to guide decisions have an idea of the risk involved. Deleted repeated post. Not sure how I posted twice. Phil, both excellent points. I have no medical expertise, only my personal experience. It may be, as you say, that any resistance I have to giardia is genetic. But I do note that I suffered some pretty acute symptoms at one point very early on in my backpacking life, and some lesser symptoms one time not many months thereafter, and none since (32 years and counting). At no time did I take drugs to alleviate those symptoms. Maybe it's a combination of both genetics and acclimation for me. As for new folks, or even old folks who have never tried drinking unfiltered: I DO NOT NECESSARILY RECOMMEND THAT YOU PERSONALLY TRY THIS. As Phil points out, the results may be personal and variable. YMMV! And that's a very good point about the straw-filters. I tend to ignore them like I do all filters, so sometimes forget they actually work nowadays. The biggest draw for me of going filterless though is still the way I feel a greater communion with nature by drinking right from the stream, just as I do eating berries right from the bush. To be clear: I don't just drink from any old puddle. I try to find nice clear water running at a moderate pace. If I'm stuck drinking from a mud puddle that water will be boiled or treated in some way. Funny! I suppose technically a liter of hot water is actually a tad lighter than a liter of cold water (but only because it's less water occupying the same volume). I like your story Zalman. We used to drink out of creeks all the time. I still do once in awhile under safe conditions. My brother and his wife travelled for 7 months across Africa from Morocco to Kenya. They boiled their water most of the time. A couple of times they got caught in the heat of Sub-Saharan Africa and ran out of water. They drank out of some creeks. They had few ill effects considering the conditions. When they got home they got treated for parasites but had none. I used to ride with professional cowboys on my Dad's ranch. They rarely carried much water. They taught me to find springs and even to drink out of cattle tracks. Nobody ever got sick but there were few people around. When it comes to western mountain water, me thinks the Filter Syndicate has conspired with outdoor retailers to terrorize people into believing danger lurks at every runnel. I only infrequently treat my water when camping in the Sierra, Cascades and Rockies. For the most part these waters have lower microbial counts, including giardia, than municipal water. Likewise for other harmful organisms. Universities and water districts perform ongoing analysis of these waters and publish in the web. With some effort you can probably find information pertaining to your chosen region. Microbes tend to reproduce more quickly in warmer water. Cold water will kill some microbes and cause others to enter into dormant and cystic states. Therefore microbe counts are lowest in early season. The studies stated winter provides a period where low microbial activity allows the water to self-flush the entire system. That said, the vast majority of flowing water sources in high and late season are still considered potable without treatment. Ranching, farming and mining all correlate to higher microbial counts. In fact livestock grazing is the greatest correlating factor to contaminated water. Waters draining areas frequently traveled by stock animal also correlate. Areas with extensive human activity should also be considered suspect. By extensive consider Yosemite Valley, portions of Tuolumne Meadows within a few miles of the road, Bridgeport or Mammoth Lakes; most backcountry regions are not considered significantly impacted by human traffic. Avoid stagnant waters. Microbe counts tend to blossom in waters that do not discharge or sluggishly flow. This assessment should consider not only the immediate location where water is drawn, but everything upstream as well. Water sources distal to their headwaters are also suspect, due to the fact they may have upstream conditions correlated with the aforementioned risk factors. Try to plan trips so camps have access to quality water sources. Avoid drawing water downstream of livestock areas. Avoid drawing water from sources that have trails accessing upstream basins. Avoid drawing water from sources that have upstream trail crossings. Avoid drawing water from lakes. Avoid drawing from major streams and rivers. If I have bulk storage containers of water, I replace the contents daily to preclude a buildup of organisms. On extended trips I sanitize all water containers once a week with bleach. When my water sources do not meet my criteria, I use a two step chemical treatment to sanitize the water. My stated practices lead one to believe that western mountain water is not that safe at all, but my practices are to assure a high degree of confidence in the potability of my water. While it seems my criteria severely limits my options, in fact there are LOTS of options for potable water; even along busy JMT and Mt. Whitney trails there are plenty of water sources with no upstream trail access. The above practices only apply to western mountains. If I was camping in the deserts, other lowlands, or the eastern US, I would definitely utilize water treatment regimes. And for the record, I also drink straight from reliable water sources after thorough evaluation of factors above...im in the water resources field so understand the value of good groundwater. I agree west vs east is a different ball game and higher risk in the more impacted Eastern areas. To be honest, I broke my usual approach and drank straight from a lot of sources in the highlands of Scotland without the familiarity with the area. However that was replaced with knowledge from trusted hikers and only sources where I could see the entire watershed. Juat thought we should delve into a little more detail about risks and how to evaluate them for others reading this...which as usual you all have done thoroughly. In his autobiography “About Face: The Odyssey of an American Warrior,” Colonel David Hackworth mentions how if you give a soldier a rucksack he’ll fill it, and that the troops of his infantry battalion would go on patrols & operations in Vietnam with only what they could roll up in a poncho and carry under an arm (and drop when contact was made.) This obviously doesn’t include weapons, ammo, entrenching tools, and other fighting gear, but when you look at the burdens carried by troops in Iraq & Afghanistan lightening your load and stripping down so you can actually move seems like a good idea. When you’re carrying a majority of your body weight on your back even a minor slip or fall can cause a debilitating injury, not to mention the long-term effects that many infantrymen suffer from when they hit middle age (or earlier.) Plus you’re not exhausted from just walking around before you even make contact. Good post by Ed. I worked around mine sites for 30 years and did water quality studies the whole time. Some mines contribute to water quality degradation, which is why they are carefully monitored. I can remember no instance where microbial constituents like Coliform bacteria where ever elevated due to mining. Livestock and wildlife species can certainly contribute large microbial loads and indirectly contaminate surface water sources by contributions of N and P. The good news is that humans have much different gut flora than livestock, and only a small fraction of the microbes can make us sick. There are some cases where wildlife like beaver, can act as alternate hosts and create problems. You always have to know what is upstream. I would have thought the same, but then before doing the JMT I read about some prof at one of the UCs who was monitoring high Sierra lakes, found no bacteria, and pointed out that these clear lakes are baking in high altitude sun day after day and the UV in that sunlight is a darn good purifier. I still avoided drinking form lakes with established campsites around but drank freely from some of the higher ones. I also recently drank direct from some of the clear springs bubbling out from along the walls in Paria Canyon. In both cases, my wife and most other companions refused to partake. But we do use a Steripen or Aquamira to treat more dubious sources in the US. I have no patience for filters. We had an old and little-used MSR filter that we tried to sell here on TS, no takers, so we gave it to a friend. Funny thing about any of these methods is that there's no way for the user to check if they're actually effective, you just have to believe. Wanna buy a bridge? Backcountry water treatment is not a thing in Norway, even though Norwegians will happily shell out for just about any piece of outdoor equipment you put in front of them. Instead of filters etc. 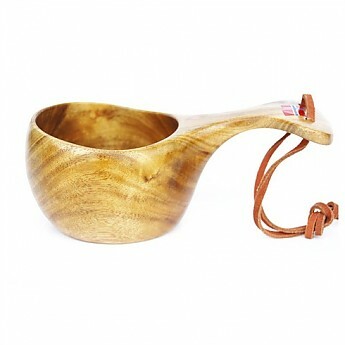 Weegies often carry a wooden dipper (below) or plastic foldacup for drinking straight out of the lake or stream. When you stay at a hut you use stainless steel buckets to haul water up from the nearest source. Sheep are allowed to graze in the mountains including in NPs, but at low densities and nobody seems to worry about it. I have seen warnings in lemming years when little lemming corpses could potentially contaminate streams, but again people don't seem to worry about it all that much. I can say my experience supports Big Red and Ed's thoughts: I do drink from clear lakes without worry, and have almost exclusively backpacked in North America, west of Denver. Thanks to Big Red for the reminder about UV light especially at high elevations. I paddled the Boundary Waters in 1985. At that time the USFS had developed backcountry latrines and a moderate level of use in designated campgrounds. The official policy for years was that it was okay to drink out of the lakes without treatment. It was a lot of fun to take a cup and drink directly out of the middle of a lake on a warm summer day. After while we practiced the Voyager style of taking a drink. Throw your wooden paddle down vertically into the water. When it bobs back up, catch it and hold it over your head and drink the water that runs off the paddle blade. Now there is an advisory against drinking directly out of the lakes. Another important attribute of wildness has been lost. UV ray can be effective, but keep in mind for water in deeper lakes (>30') the effect is greatly diminished, due to the rays getting absorbed by the water. Likewise materials suspended in water will reduce UV penetration further still. OTH high lakes have very short growth seasons, due to extended cold season, and have minimal fauna and human interactions to spur microbe activity, so microbes counts remain low. Nevertheless I prefer to draw from their inlets than the lake bodies proper. Hopefully you told them that THEY should probably also keep their tent with them, regardless of what you appear to be carrying! All forums: Older: "The more we discuss, the better the gear will get." Meet David, Reviewer of the Month Newer: My gear selection for a weekend hike.